Shortcut in a Sav army mount billiard and coffee. Automn evening in my rattray dedicated for aromatics. On men’s retreat this weekend at the beach, three or four guys smoking pipes! Good times! I had Royal Yacht in my Pete 313 rustic. This pipe has such a small bowl I ended up refilling it for a total of two bowls in less than an hour but it smoked cool and dry both times with minimal lighting. No dottle, just Ash at the bottom both times. This pipe is better suited for VA flakes but handles anything I run through it pretty well. C.1.1 in the CPS POY that was the Sav. apple, whatever year that was. Anyway. This has 10% Perique in it with other stuff that doesn't matter right now. 10% Perique and I like it. I like it a lot. On the menu today - a Nub Maduro. Daggon that is a sharp pipe! AnungUnRama wrote: On the menu today - a Nub Maduro. Did you grind it up and stick it in your bowl or did you just mistake this for the cigar room? I kid, happy puffs sir! I made the mistake one time of smoking the end of a cigar in my pipe afterwards. Words cannot express how sick that made me. I have considered grinding one up before but no. Today was a cigar day. 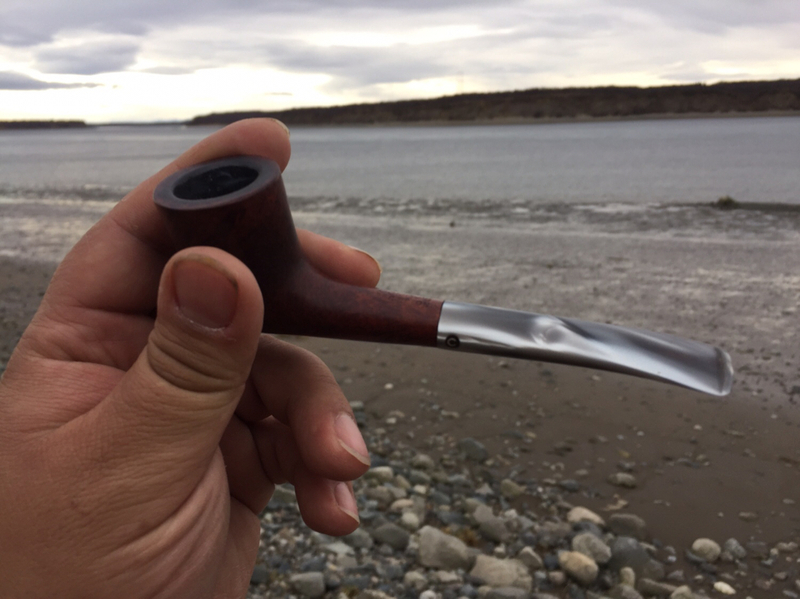 Too windy for a pipe but I prefer a pipe to a cigar most of the time. How ah-boot of a pic of this pipe? Here you go. This was the gift from my "Secret Santa" 2 years ago. 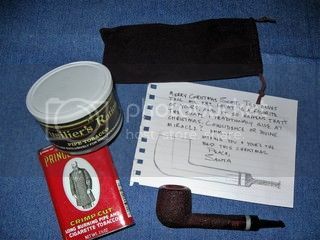 It came with a tin of FR and the pipe and tobacco remain a great pairing. It is the only pipe that I have ever felt natural clinching...it just sits perfectly in the left corner of my mouth.